Hampton Creek Cove is a 693-acre natural area in Carter County near Roan Mountain State Park which is managed by the State in partnership with the Southern Appalachian Highlands Conservancy. The main attractions are the hiking trails, most notably the Overmountain Victory Trail which traces the path of a patriot militia which set out from Fort Watauga in Elizabethton in 1780 in pursuit of the British -- culminating in the pivotal patriot victory on King's Mountain in South Carolina. The actual trail taken by the patriots encompasses four states: Virginia, Tennessee, North Carolina, and South Carolina (see the maps below). For more of the history of the Overmountain Men and Battle of King's Mountain, click here. What you'll discover at Hampton Creek Cove is a beautiful pastoral scene. The land continues to be used for farming - so you'll find yourself walking through cow pastures and opening and closing gates as you hike. 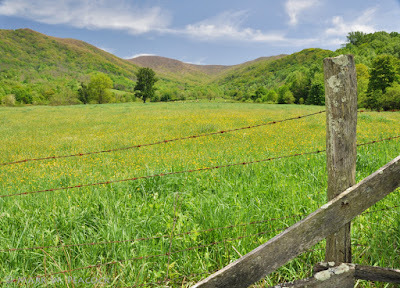 The Overmountain Trail roughly follows Hampton Creek through the valley's gorgeous, rolling pastures, eventually entering the forest as it climbs Yellow Mountain where it connects with the Appalachian Trail (a 3.6 mile hike one way). The Birchfield Trail parallels the Overmountain Trail, but follows right along side the creek, offering a beautiful woodland hike. A third trail, which I haven't taken, is called the Shell Hollow Trail - a 2 mile round trip loop. Lots to explore - plenty of wild flowers - history - and beautiful views. Update: click here for another post of mine from a more recent visit. For driving directions to Hampton Creek Cove, click here. For Hampton Creek Cove trail map, click map above. 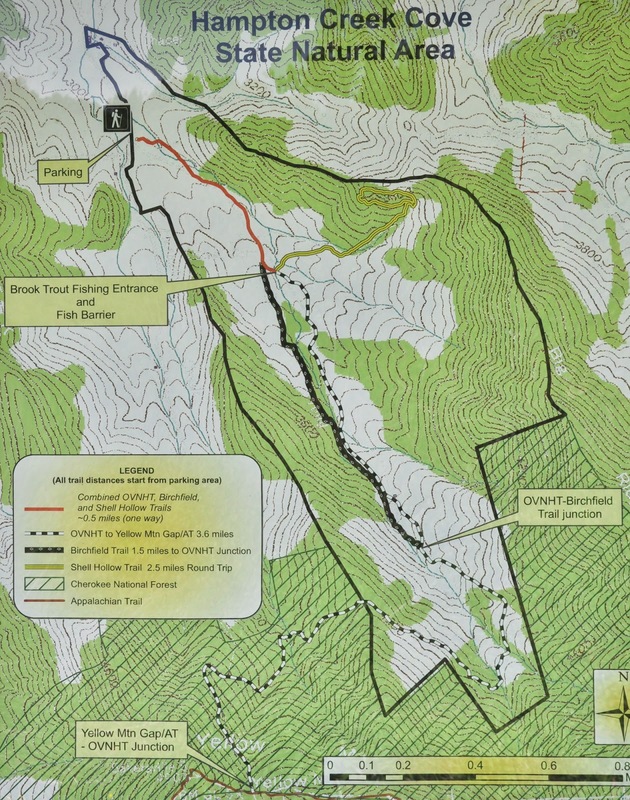 For a map showing the Overmountain Trail Map, click here. For a map showing the Overmountain Motor Route Map, click here. 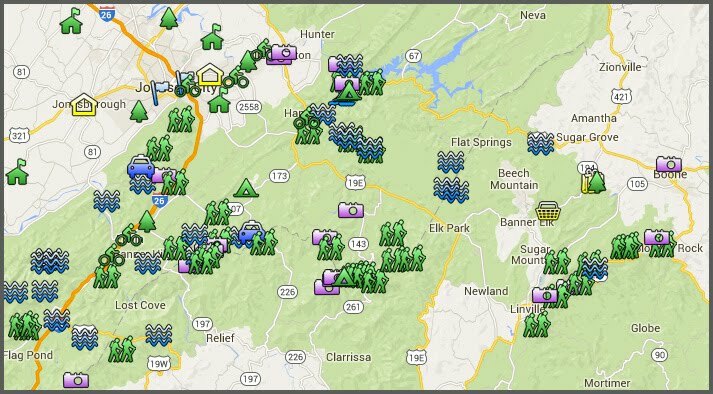 Mark, do you know if there are any places to camp along the Overmountain Trail? Went there the other day with my son. The trails are very hard to find. There are gates all over the place, one did have a white blaze on it. There is a farm house next door and there were cows out in the field too. Kind wasn't sure if we were on the right track or not at times. After parking at the trail head, we began walking thru briar patches and mud, we finally found an over mountain sign and a brown trail marker, both of which were broken and laying in mud. We never did find the wild trout stream, but there was a small stream running thru there. I'm not sure if the trail gets any better past those gates and broken signs or not. Definitely needs some maintenance and markers. I would not leave my car there overnight. Hiked this area a little. Trail signs are there. When you get to the impoundment area, which is about 15 minutes into the hike, go through the rusty gate before crossing over the stream, and you will get to the creek. Also, if you go ahead and cross over the stream there, you go through the hiker-pass-through and head to your right, staying near the main creek, eventually you will come back to the creek and there are some more fishing spots, based upon the map. I didn't go that far. Andy, Did you notice if there were any campsites along the Birchfield Trail or Overmountain Trail section of that loop? I'm looking for a shorter, lower elevation backpack near Roan Mountain for this summer.